I've been writing for The Jack Kirby Collector for over a decade now, and been studying Jack and his work longer than that. And in all that time, I've probably seen an hour -- maybe two -- of video footage where Jack speaks. He gave plenty of interviews and spoke to untold hundreds of people in his lifetime, but very little of that was committed to film. Even so, I was skeptical when I heard that Glenn B. Fleming was making a DVD of some of his time talking with Jack back in 1991, just a few years before Jack's death. I didn't doubt that Fleming's footage was authentic, but I thought, "What am I going to get out of it?" as it didn't sound like it was any more than just some random footage of Jack rambling about whatever. 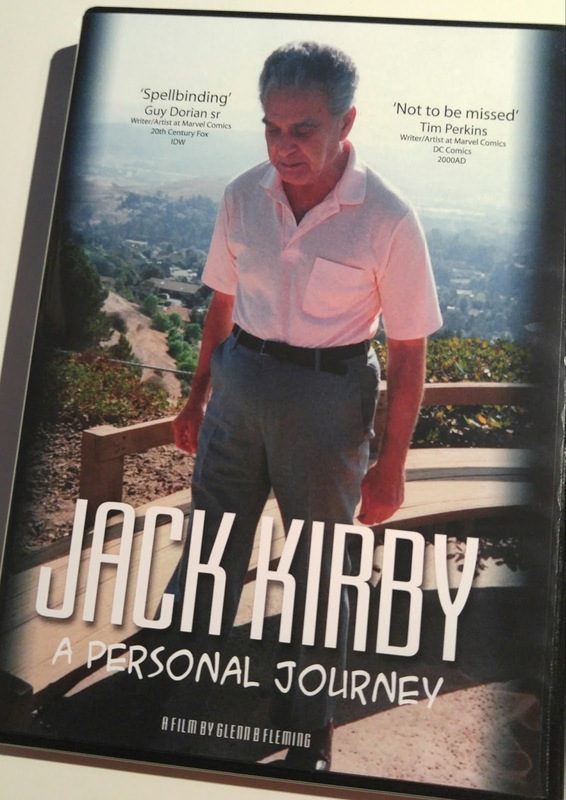 After watching Jack Kirby: A Personal Journey, I think it's smart that's what Fleming is essentially billing it as. The whole DVD is a little under an hour, and half of it is Fleming explaining how he came to meet Jack with the other half being lightly-edited video camera footage as Jack talks in his studio. The production quality of the whole thing is better than just converting old film footage to a digital platform, but not by a whole lot. Which is perfectly fine for what this is. Fleming's story isn't critical to watching the footage itself, but it does provide some nice anecdotes and Jack and Roz's personality and demeanor. 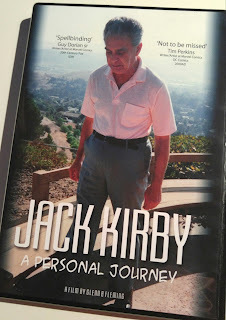 And the footage of Jack, too, doesn't reveal any great insights about the man or his work. He does relay a few anecdotes I'd never heard before, like flying upside-down over the Chrysler Building and hanging up on NASA, but there's little in the way of great revelations. The video does more to showcase his demeanor and attitude and character, particularly outside a strictly comic setting as most of the other existing footage of him focuses on. It is cool to see his mantle with an Alley Award and a Yellow Kid award next to some fan art and photos of his kids, but the grainy quality of the footage is such that, by and large, you can only make out what you already recognize. I think Fleming is sincere when he says that he enjoyed reviewing the footage for himself and just wanted to share it with others. It's not designed to be a mass market product, and I think the audience for this is probably limited to regular readers of The Jack Kirby Collector. (After all, if you're just interested in hearing what Jack sounded like, there other videos on YouTube for free.) I didn't get a lot of concrete information that I didn't already know, and Jack doesn't say anything especially profound here, but I still enjoyed spending some time with an amazing talent that I never had the chance to meet on my own. Fleming is selling DVD copies of the movie from his website for $20 US/£12 UK.